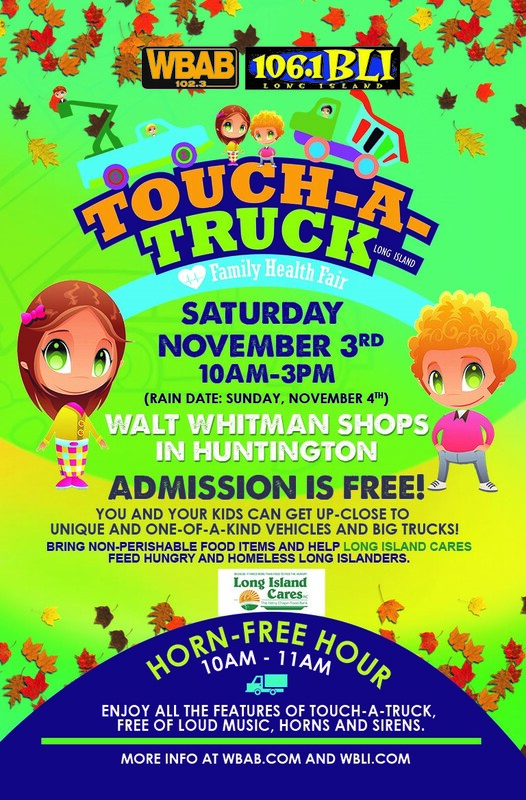 Long Island’s own 102.3 WBAB and 106.1 BLI’s Fall 2018 Touch-a-Truck is back! Touch-a-Truck is a wonderful event where kids can explore the different types of trucks and equipment from police cars and fire trucks, to bulldozers and front loaders. Children will have the opportunity to not only sit in the trucks, but learn about their abilities and what makes these machines so fascinating. This is a free event, though we do ask guests to bring a non-perishable food donation for Long Island Cares to help them feed hungry and homeless Long Islanders. 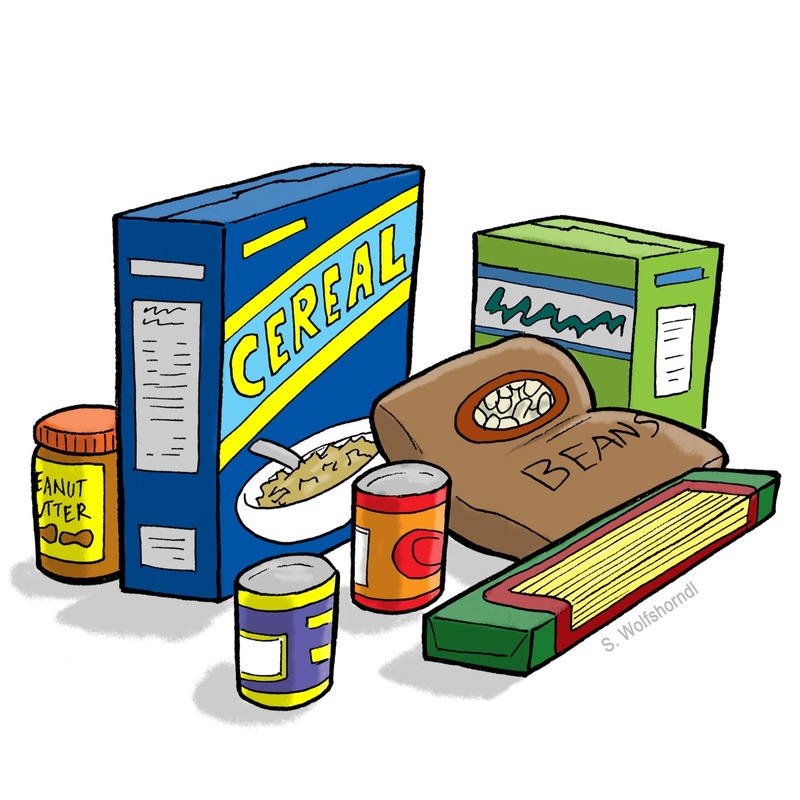 Please donate any amount of food items you can! 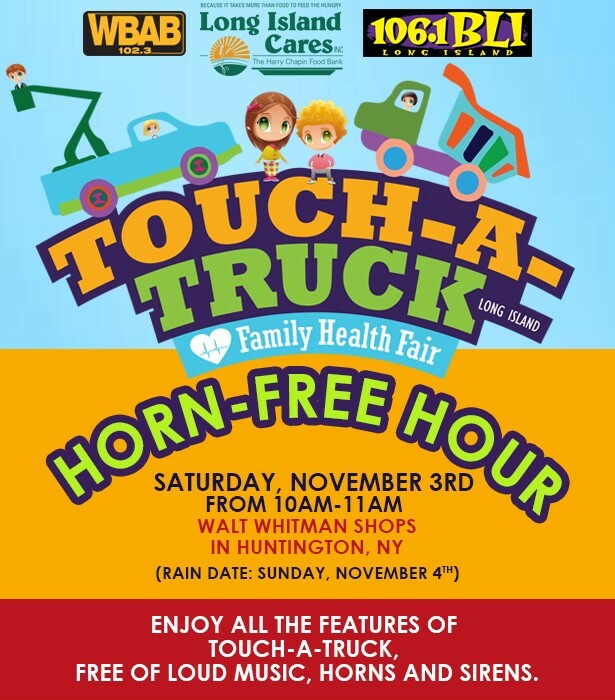 Touch-a-Truck will be held at the Walt Whitman Shops in Huntington on Saturday, November 3rd from 10:00AM to 3:00PM. The rain date for the event will be Sunday, November 4th. The first hour of the event, we like to hold a “horn-free” hour. During this time, children with special needs or who may be sensitive to sounds can enjoy the event without loud sirens and other distracting noises. In addition to the unique vehicles, we are thrilled to be partnering with Suffolk County Executive Steve Bellone to bring the event back with a brand-new feature, the “Family Health Fair!” It will provide attendees with the opportunity to explore and interact with a variety of pediatric and family health specialists. This is not only a fun and entertaining day, but also a wonderful, hands on learning-experience that children and adults will enjoy. Hope you and your family can attend!